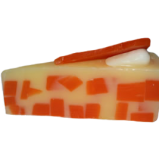 Pavlova – Gourmet Fun cake slice is a stunning piece of soap craftsmanship. A very subtle passionfruit & Kiwi Fruit scent , that will delight the Pavlova fans. 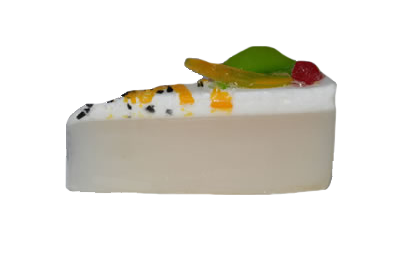 Pavlova Gourmet Fun Cake Slice Soap – A stunning piece of craftsmanship. 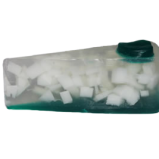 A very subtle passionfruit & Kiwi Fruit scent , that will delight the Pavlova fans. 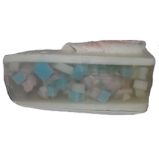 This soap looks like a real slice of pavlova with strawberry, kiwi fruit slice and drizzled with passionfruit seeds in a clear yellow jelly soap on top. A gentle middle aroma for those customers that want something not too strong.